The Christian life is not a solo venture. It requires teamwork. God has given us an incredible resource in our brothers and sisters in Christ. We desperately need each other so that when we want to quit, we can’t, because our friends won’t let us give up. Lasting change requires biblical friendship. Note the qualification: biblical friendship, because not all friendships are biblical. In fact, some are very unbiblical. They not only don’t help us, but they also impede our progress on the path toward transformation. People who are growing and becoming more mature followers of Christ are surrounded by biblical friendships. Without that kind of friendships, Christians cannot flourish spiritually. Change does not happen in a silo, just you plus God (and maybe your Bible and a flashlight). It’s time to knock the silo down and invite others into your life. As you read God’s Word, you can’t help but notice that great men and women of faith always had supportive friends around them. Always! When you think of Abraham, you think of Sarah, his loving wife and good friend. Although she made mistakes, just like Abe, Hebrews 11:11 raves about her faith. Sarah stuck with her husband through thick and thin. Without her loving support, Abe would have had a much harder time following God’s call. Moses’ life can’t be understood apart from the role of his supportive relationships. His brother, Aaron, spoke for him, and his father-in-law, Jethro, provided leadership consultation on how to delegate, which saved Moses’ sanity. Moses’ sister, Miriam, stood with him when the people rebelled. Moses’ friendships also extended beyond his family. When everyone else doubted, Joshua and Caleb stood with Moses, insisting that the children of Israel could conquer the land. The list could go on and on. Ruth and Naomi loyally served each other. Alone in the seductive world of palace life, Queen Esther stood firm in her faith because of her cousin Mordecai, a solid friend to her. David and Jonathan became soul brothers. Elijah and Elisha, two prophets under attack, stuck together. Barnabas was a true friend to Paul, even when everyone else feared the former Christian-hater. Silas and Paul sang together in prison. Paul mentored Timothy, and Timothy comforted Paul when he was again imprisoned near the end of his life. And of course, Jesus had twelve close companions who lived, ate, slept, and journeyed with Him. When Jesus sent His disciples out to do ministry, He sent them two by two. Why? Because of the power of biblical friendship. God sent the prophet Samuel to teach King Saul how to lead well, but Saul refused to listen. As a result, his life ended tragically. David’s downfall was directly related to the lack of wise counsel from his military general and personal friend, Joab. When David sent orders to set up Uriah’s death in battle, Joab obliged. Rather than warning the king against being an accessory to murder, Joab stayed silent. Samson had potential—handsome and strong, chosen by God from birth, with the Spirit of God resting on him. But he made foolish, self-destructive choices, and in every bitter moment, he was alone with the enemy. Just like the men and women in God’s Word, we have abilities and potential and a desire for God, but without biblical, truth-telling friends, our lives will flop. Do you already have biblical friends? If so, cultivate those priceless friendships! Maybe you need to verbalize your friendship and its value, even as David and Jonathan did. True, biblical friends are instruments God will use in your life to help you grow. Change flourishes when it’s a partnership; it’s easier to go where God wants you to go when you have a friend who’s on the same journey. You need a true, biblical friend. Pray and think about someone who can hold you up when you stumble and hold you down when you stray. Dear Lord, thank You for friends. Thank You that You don’t want us to be alone. Please help us to find a true, biblical friend who will challenge us, and help us to cultivate that friendship. 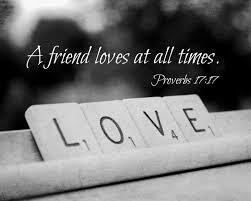 Teach us to be a true friend, to love that person at all times. In the Name of Jesus, Amen.